Comments: Philip Palm, an immigrant from Sweden, operated the Scottsville Carriage and Repair Works in the early 1900's. In addition to making and repairing carriages, Palm upholstered furniture, repaired shoes, and made frames. He also made coffins and served as the town's undertaker. The Scottsville Carriage and Repair Works, shown in the photo below, was located on the north side of Main Street in what is now the Methodist Church's parking lot and just west of today's Scottsville Museum. The building burned down in 1976. By 1914, Phillip Palm and two business partners, L. Gordon White and Thomas Ellison Bruce, entered into a business venture known as the Scottsville Furniture Company. Mr. Palm served as the manager of this firm that sold furniture and house furnishings, coffins and caskets, buggies and wagons. 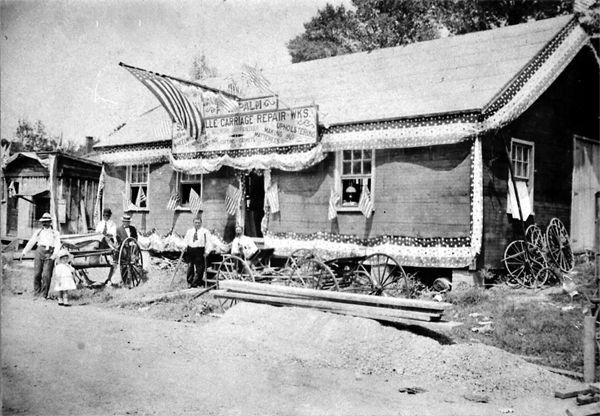 This shop is shown below, decorated for the Fourth of July with red-white-and-blue bunting in 1916. 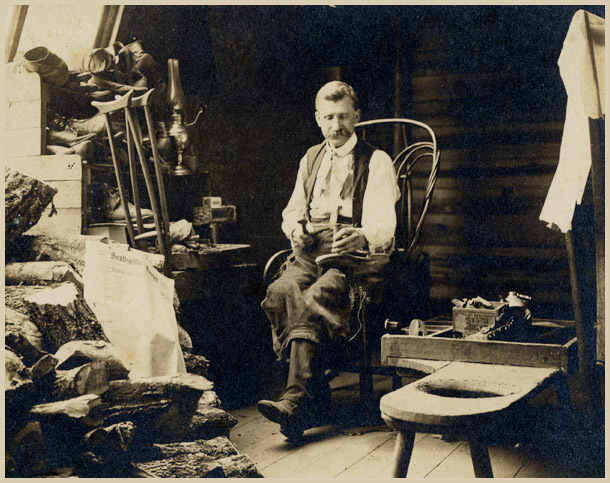 Tom Cornett, the man standing with crutches at the middle of the picture below, worked as Palm's expert shoemaker. A past Master of the Scottsville Masonic Lodge, Mr. Palm's portrait still hangs in the Masonic Lodge with photographs of other distinquished Scottsville Masons. Philip Palm died in 1920 and bequeathed his Scottsville property to Edla Sophia Palm of Linnegatan, Upsala, Sweden.